VATICAN CITY – Relief workers for the Catholic aid organization Caritas responded immediately after a violent tsunami struck the South Pacific island groups of Samoa and American Samoa. A magnitude 8 undersea earthquake at dawn Sept. 29 set off a series of four giant waves. The disaster left more than 100 people dead, but the death toll was expected to rise. 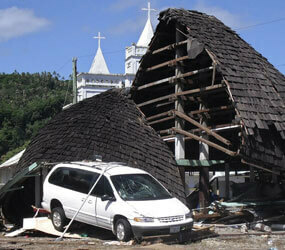 The tsunami also caused considerable property damage to the Samoan islands of Upolu and Savaii. The director of Caritas Samoa, Puletini Tuala, said the first concern was to gather the people and lead them to higher ground, then to assist with shelter and assess other needs. A group of Caritas staff visited one of the worst-hit areas on the south side of Upolu. They led survivors to high ground, cleared land and prepared temporary shelters, according to a Caritas statement. Caritas was collaborating with the National Disaster Team and the Red Cross to coordinate a plan for the tsunami response. It was also cooperating with a local Catholic school and other members of the community to respond to the emergency, the statement said. Earlier this month, Caritas in Samoa hosted other Caritas members from the Oceania region for a conference on Upolu that included a trial run for a tsunami response. The tsunami Sept. 29 destroyed the center in which those meetings where held, Caritas said. A statement from the U.S. Embassy to Samoa said President Barack Obama declared that a major disaster exists in the territory of American Samoa and ordered federal aid to supplement recovery efforts in the area. Salesian Father Sefo Mulipola said in a statement from Manono Island, part of the Samoan chain, that his family home was partly destroyed by the tsunami, but that the family members were all safe. Father Petelo Vito Pau, rector of the Salesian community in Alafua, a village just outside the Samoan capital Apia, said that the Salesians and the Daughters of Mary Help of Christians on the island were secure.